Perth’s leading SEO firm has been serving the City for over 13 years. 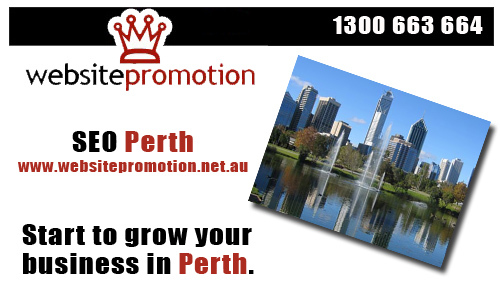 SEO Perth by Website Promotion provides a wide selection of business packages suitable for your Search Engine Optimisation needs. Website Promotion also provides quality and professional web designs including those websites for online store, personal websites, business websites, corporate websites, educational websites and more. By getting the service of SEO Perth, you can guarantee first page results among search engines at a cost-effective price. If you are looking for affordable SEO Perth, Website Promotions offers a wide range of SEO Packages to start your business grow and dominate the Search Engines. Search Engine Optimisation provides opportunity for your business to get higher visibility online, drive traffic and gain lots of customers. Call 1300 663 664 now and learn how Website Promotion can help you.